The next-generation G11 BMW 7 Series is rumoured to debut with an iDrive interface that supports touchscreen operation, and this technology demonstration at CES 2015 pretty much confirms it. 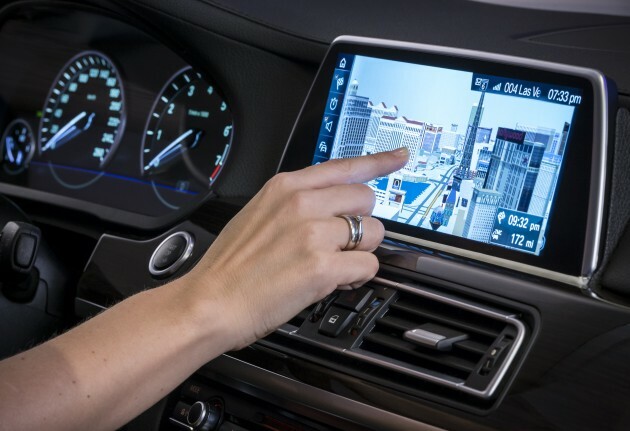 According to BMW, both the iDrive rotary controller and the touchscreen interface can be used to control all functions, as opposed to existing systems which may allow each input feature to only control a certain set of features and not others. The system is also smart enough to only show touchscreen controls when needed. For example, an on-screen keyboard for text input will only pop up when the user’s hand approaches the screen. The new system also supports gesture control, which the automaker began experimenting with three years ago. Basically, the ‘air space’ in the area between the gear lever, steering wheel and Control Display is open for you to wave your hand about for certain commands. A sensor in the roof detects whether one or two fingers are being pointed, or whether the thumb and index finger are being moved towards each other. The system decodes different movements – such as tapping, finger rotations or a swiping movement to the right – and performs the desired input. A rotating movement can be used, say, to alter the volume of the radio, a finger raised to accept a phone call or a swiping movement to decline a call. In addition, future versions of iDrive will also support a tablet-based entertainment system, which is in line with rumours that the next generation G11 7-Series will offer the front passenger to have an entertainment system. 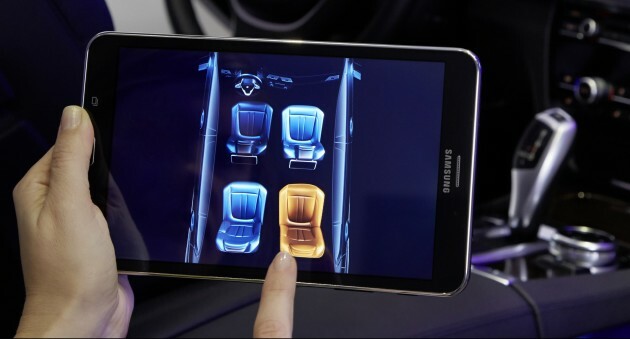 The CES 2015 demo of the new ‘Touch Command’ system uses a Samsung tablet that is connected to the iDrive system via an on-board WiFi network. The tablet is kept in a crash-proof holder and can be recharged by means of a snap-in adapter. A BMW app in the tablet makes it possible to control all available devices, such as the Rear-Seat Entertainment System and even the climate control system. When it is being used, the tablet can be either left secured in its holder or removed. All functions are permanently available thanks to the WiFi connection. This sounds a lot like Audi’s Android tablet rear entertainment system in the new Q7. We’re expecting a lot of this to eventually appear in the new 7-Series, so watch out for more details. 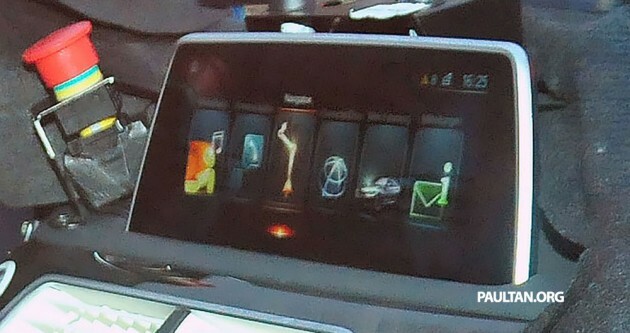 What they didn’t show at CES 2015 however, was the new iDrive interface seen in our new 7 Series spyshots. The shot shows the 7er sporting a new iDrive interface that uses large icons arranged in a horizontal list, while the CES 2015 demo used the current iDrive interface with a vertical text list. In the future there will be a case people steal tablets from Audi’s and BMW’s. Where is Proton in CES 2015? Where is the GSC (Global Small Car)? Instead of Sendiri Cakap Sendiri Syok, can you please do something on the world’s stage and make Malaysia proud (after burning billions of ringgits)? Good Where is GSC(Global Small Car), is they can make it. TATA Nano and SMART is what? If p1 sells it with those tech at 120k, you want to buy? Woah, so P1 no more value ah? BMW stand for drive ability, leave those electronic gadgets to Lexus. About time they upgraded the class leading iDrive system…. Duh…BMW so fast upgrading their iDrive. Make the current one at F series look so outdated. Meanwhile Toyota just introduced latest hilux with TRD stickers and 4 speed auto. The iDrive rotary dial is one of, if not the best systems in luxury cars. So its good to hear that they want to take it a step further. Welcome the touchscreen too. If its going to have a tablet on top of the dash, might as well make it touchscreen, so easier to pinch & zoom. Now, if only BMW can work harder on the exterior & interior design. Mercedes is so far ahead in those areas with the S & C Class.